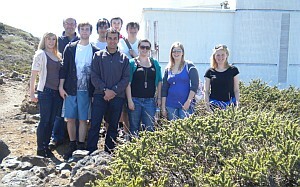 A group of 8 Sheffield MPhys students visited La Palma for one week during April 2012 to undertake their third-year astronomy project using pt5m, the Durham-Sheffield 0.5m robotic telescope on the roof of the WHT. The students observed transiting exoplanets, contact binaries and eclipsing white-dwarf binaries using the UBVRI imager on pt5m, obtaining some excellent-quality light curves. 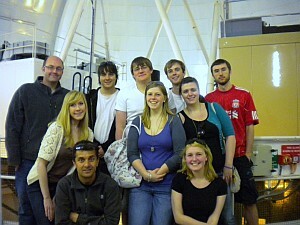 As well as their pt5m observations, the students were also given in-depth tours of the WHT, INT and GTC telescopes. The trip, which was led by Professor Vik Dhillon, was a great success and will hopefully now be an annual fixture in the Sheffield Astrophysics MPhys degree programme. Students and teachers at the WHT and INT.